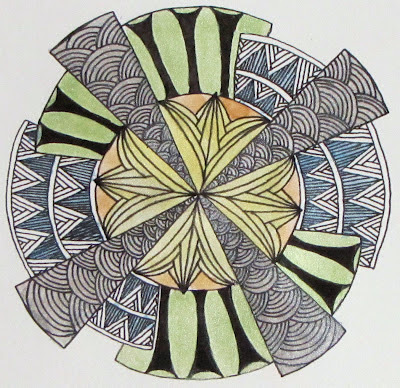 This week Erin at The Bright Owl created a Zendala template that reminded her of art deco design. After I looked at it for a while, I had to agree. I really do like the art deco style. While it isn't a style that I would normally decorate with, I enjoy looking at examples and studying it. I took the idea of art deco and tried to apply it to my Zendala. I spent hours on Saturday looking at images on my computer trying to find patterns that I could adapt to the challenge. In the end, I didn't create anything new but the top of the Empire State Building did give me some great ideas for the future. But, like my wanderings on the Internet, I digress. For this Zendala, I started in the middle. I used Hi-C's here. I really love Hi-C's because here it looks so art deco to me. Here it looks like a lily, but if you put the pattern in back to back squares, it looks totally different. It is a wonderful pattern because it looks so different in different places. I used the arches on the triangle. 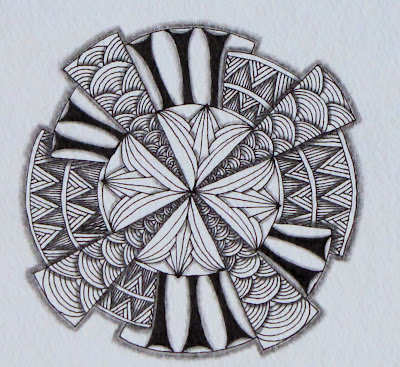 Does anyone know the name of this pattern in Zentangle? It pops up a lot in art deco design. I opted to keep the semi circle sections the same all across. I just couldn't divide the space in a way that I liked. I used a variation of Hibred. It is kind of a blending of Hibred and Knase. The black "columns" are a copy from an incredible art deco door I saw. I wasn't sure that I liked them at first, but they came to grow on me. 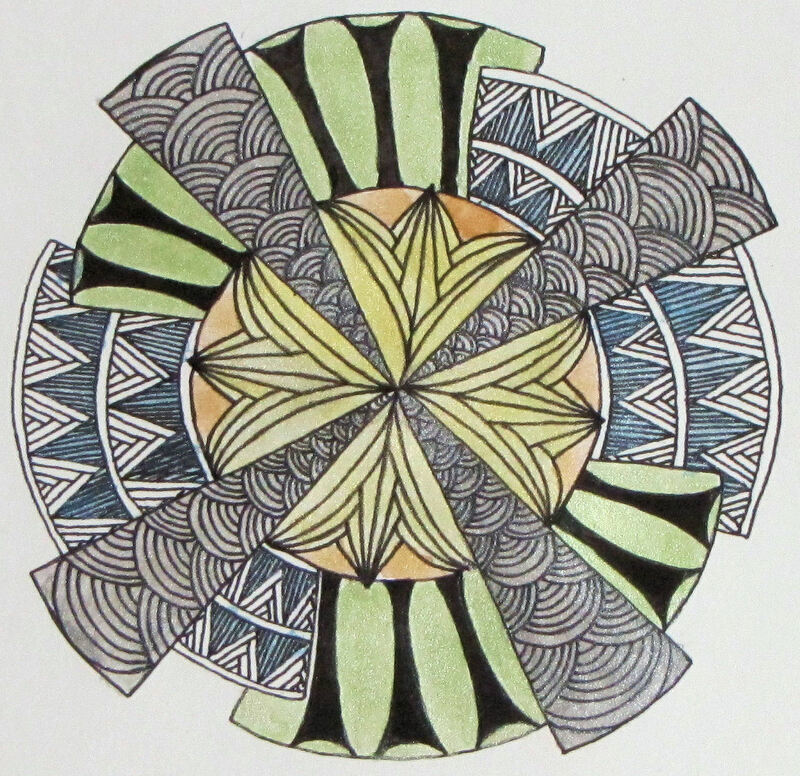 I used the silver, gold, blue, green and yellow pearl watercolor and added it right over the top of the photocopy. The photocopy didn't smear or run with the water nor did it rub off with the brush. After I finished painting, I let it dry for a few hours. I noticed that the black of the photocopy was not as dark as I now had a nice shimmer over the top. I took my micron this morning, and went back over the lines were and the black popped out again. I could have left it where it was but I wanted a blacker black. I guess I ended up drawing the Zendala after all. I hope you like them and welcome your comments and feedback. i think they are both wonderful! i am partial to color, though, and i definitely like the pearl colors you used. it makes your zendala look like a totally different piece -both are wonderful, but the second is my favorite! WOW! Have to say the color added something special to your already great zendala. Super job. 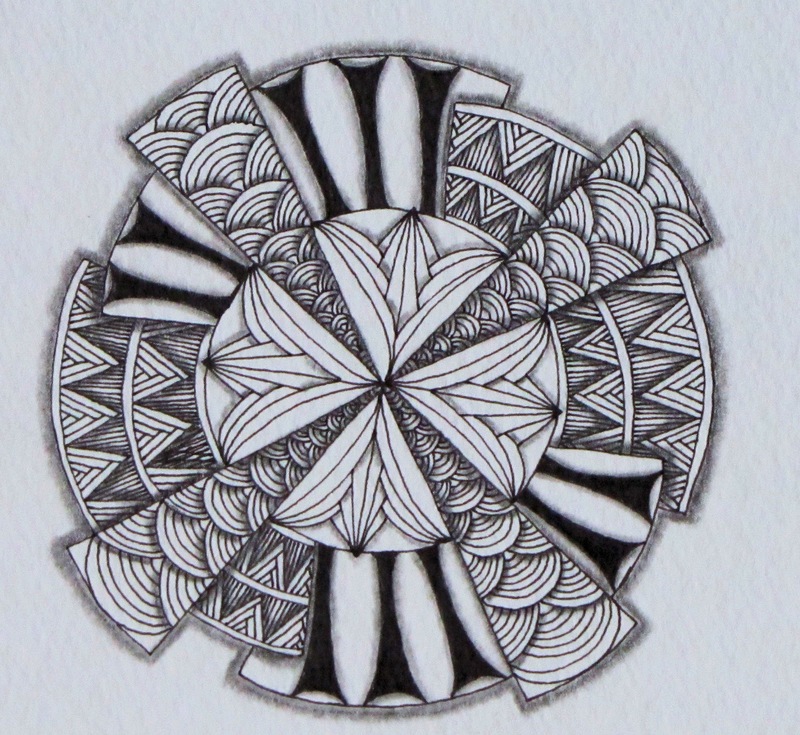 Lovely Zendala, the center really provides a beautiful focal point and I love your choice of color! I adore your style. It inspires me so much. You really nailed the Deco style with this one! And, as usual, the shading makes all the difference, making it pop from the page. Thank you for taking the time to share your thoughts and creations. I love the color in your Zendala. It's so soft and subtle. Thanks for sharing your thought process - I love to read how people get to the end product! Both your zendala's are really well done, you've chosen great tangles to illustrate the art deco style. My fav is the black/white though the color sure does look wonderful in it's softness. Nice to be able to compare. Wow! I am really impressed at your use of art deco-inspired tangles. I especially love the Hi-Cs in the center--absolutely perfect for the style. Both are beautiful. I think the colored one looks more art deco, but I slightly prefer the black and white.